Finding details of RAM installed on your PC is a tricky job for a common PC user. Even administrators and advanced users find it as a tough job to get detailed information like type (DDR 2/DDR 3/etc), speed, manufacture name and other stuff. Most of the advanced users and technicians end up in opening the cabinets to physically examine and get details of RAM installed on PCs (I’ve done this many times and landed in troubles once ). 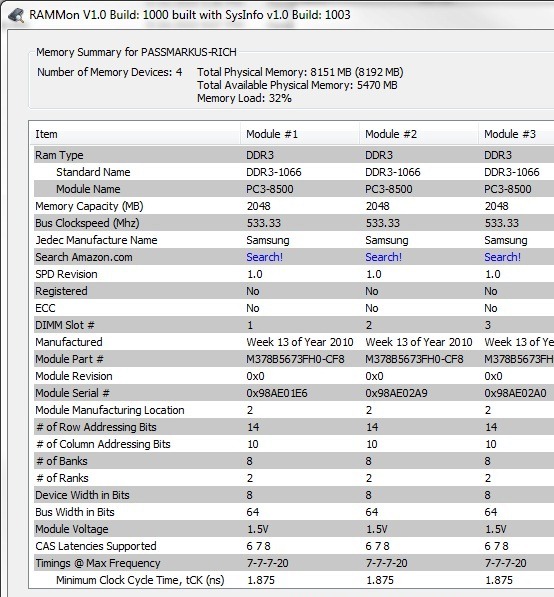 As you see in the above screen grab, there are so much of information to make use but most importantly speed, type, memory size and manufacturer name are very handy. So next time when you upgrade or replace your RAM, just fire this application get a new compatible RAM module and plug it in. By the way, RAMMon is free for personal use and corporate users need to buy licenses.